Despite a late night letting loose at the After Hours party, developers managed to wake up in time for the early morning Day 2 keynote (after having been promised yet another exciting surprise). This morning, we unveiled an early look at Google Wave, a new collaboration and communication product. 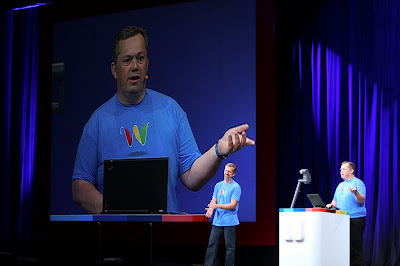 Lars and Jens Rasmussen and Stephanie Hannon presented the vision behind Google Wave and a live demo of it in action. All Google I/O attendees will receive developer sandbox accounts to test out and build on the Google Wave APIs. Yesterday evening after I/O, developers let loose and relaxed at the After Hours party. Food, drinks, music, and games were enjoyed by all. One of the attractions at the Developer Playground area of the party. The Playground featured individuals & organizations doing creative projects with technology, art, games, music. Enjoying one of the arcade games at After Hours. Mike Relm performed during the evening, as well as DJ Scotty Boy. Day 2's keynote opened with Steven Canvin from LEGO® talking about the evolution of MINDSTORMS to an open source approach. 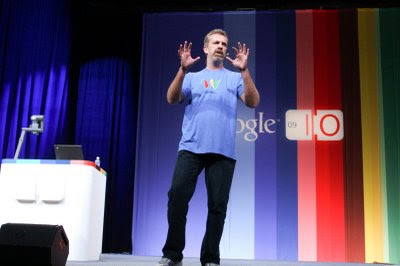 Google Wave co-founder Lars Rasmussen talks about the vision behind the product. Brothers Lars and Jens Rasmussen co-founded Where 2 Technologies, which was acquired by Google and eventually became Google Maps. 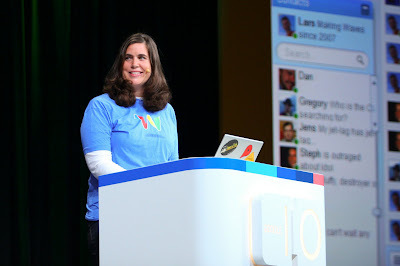 Stephanie Hannon, Google Wave's lead product manager, wows the audience with a live product demo. 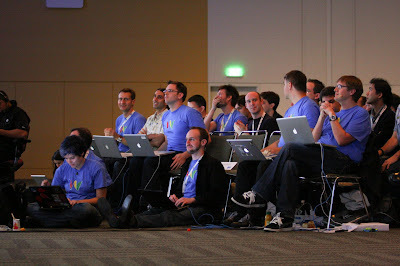 The Google Wave team watches the keynote from the front row. The team is based in Sydney. A view from the video crew desk. 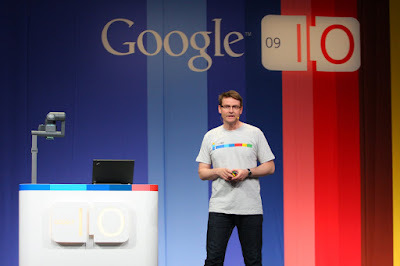 Videos and presentations from I/O sessions will be published on code.google.com/io in the coming days - stay tuned. A developer picks up his Android phone. The Sandbox interview room. The Google developer relations team conducted interviews with 3rd Party Sandbox exhibitors and will be posting them on the Google Code YouTube Channel in the coming days. 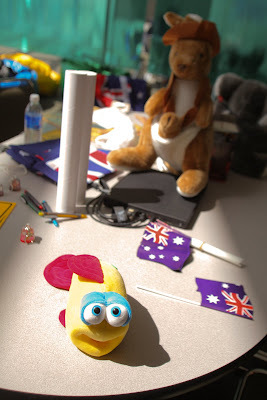 A happy Aussie fish and kangaroo greet developers dropping by Office Hours for Google Wave. wow I sure missed it, hope next year is better, can't wait to go, I'll start saving! Mind expanded by ideas, will never come back to its original state. I got a lot of information. Thanks to YouTube ! Can't wait to integrate to our web properties. Don't have a LoginID for the beta, any chance of getting one soon? GOOGLE IS THE BEST THERE IS NO SECOND PLACE ONLY ROOM AT THE TOP LOL!!! I so need one of these Waveshirts. Oh and a free Android of Course :) Thx for all the nice products.